These are not stock photos. The pictures you see are the exact Nipper Dog you will receive!
. 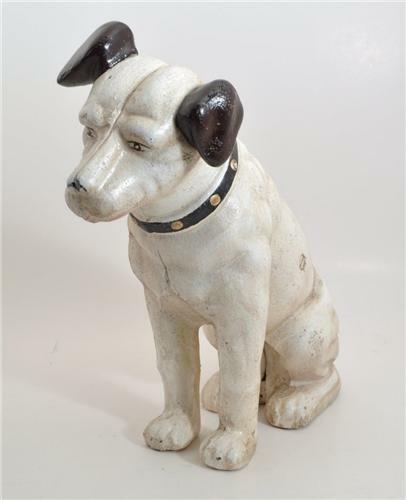 This Nipper RCA Victor Dog weighs in at 11½ full pounds!! Great Condition with Coin Slot on the back. Some paint scuffing here and there and in remarkable shape and certainly indestructible. You'll be glad you found this one! Weight: 11 pounds and 8 ounces! A Full 11½ pounds! IMPORTANT FREE SHIPPING NOTE: This will ship USPS Priority Mail Free to your Door! Our FREE SHIPPING cost includes Delivery Confirmation so you may track your purchase. New Cast Iron Flying Pig Small Heavy for Size at Almost One Full Pound!